New ultimate-match shock springs (C = 2.8) for XRAY T2 & T3 shocks. Stylish black finish. Laser-engraved value (2.8) on top spring coil for easy identification. Set of 2. New for the shorter-length shocks of the XRAY T2 & T3 family of 1/10th scale electric touring sedans, XRAY presents the ultimate high-performance racing springs that have been specially developed for rubber-tire racing, giving better balance and an additional range of choices to fine-tune your car. Developed through extensive testing and racing experience, these linear springs are shorter and have a larger internal diameter. The same thickness of wire is used for each spring, and stiffness is controlled by the number of coils. Softer springs have a lower „C“ value and more coils; stiffer springs have a higher „C“ value and fewer coils. The new springs are stylishly blackcoated and the tops of each spring are laser engraved with the spring size for quick & easy identification. 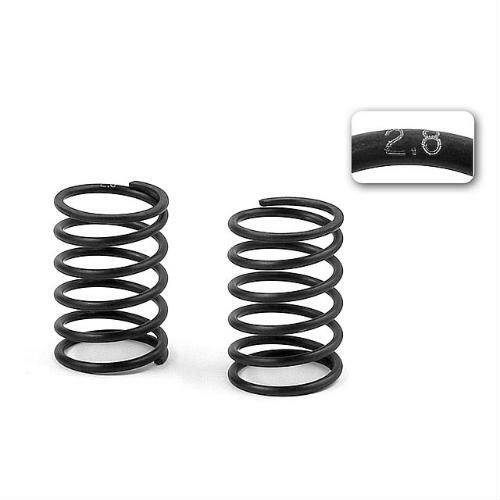 Available as a pair of springs - to fit front and rear - the springs are individually measured, controlled, inspected and matched to provide identical damping characteristics. During the selection process, each spring is compressed in several fine increments and the values recorded, and then each spring is matched with another spring of identical characteristics. XRAY goes the extra mile to ensure perfect spring matches, giving your car the predictability and consistency that you need to help you lead the pack. The new springs may also be used on earlier models of XRAY 1/10th scale electric touring sedans.